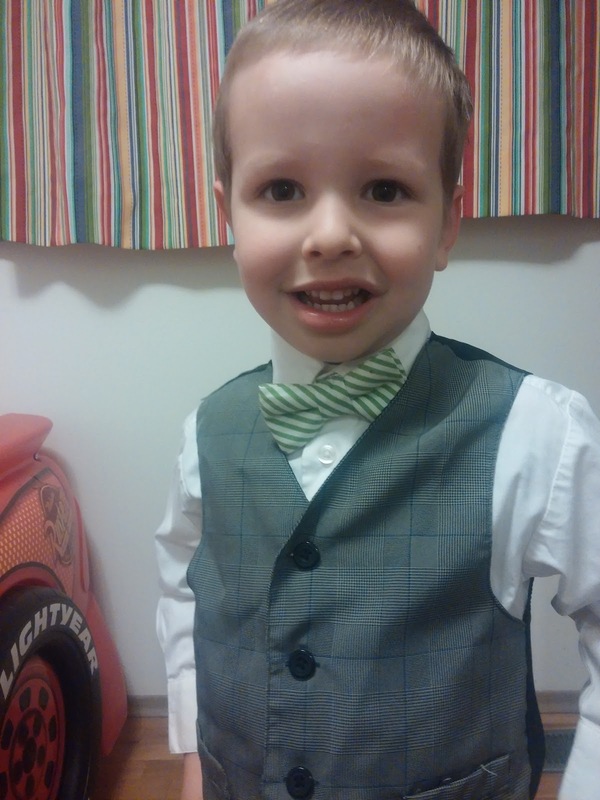 We had an ambitious day planned for B's fourth birthday. We started with presents in the morning. 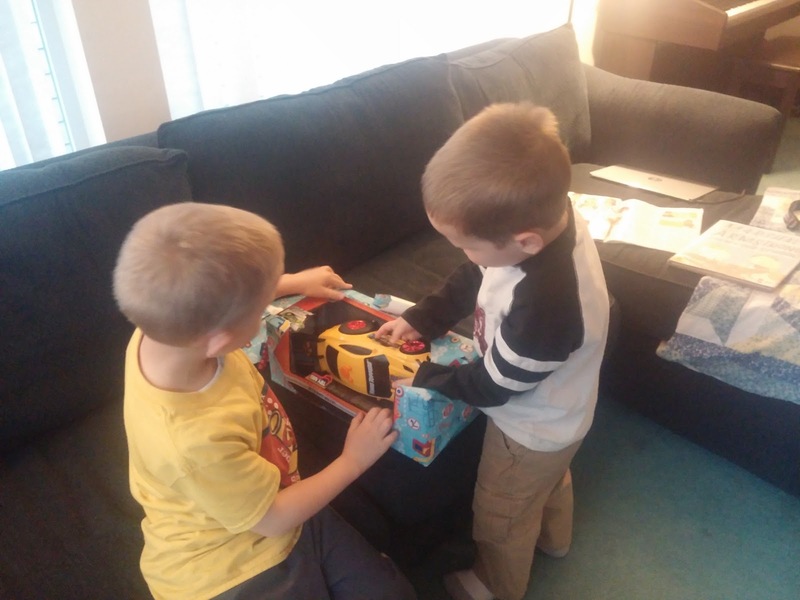 He got the race car and the police car that he had requested. 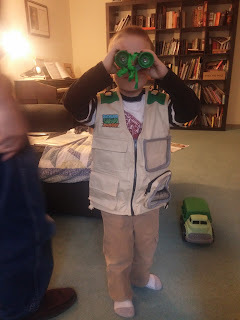 He also got this explorer vest and binoculars, which were perfect for our birthday outing to the zoo! We went to the Cougar Mountain Zoo to see their big reindeer exhibit. B is in love with Christmas, but he thought that reindeer were either mythical or extinct. In his mind they were in the same category as both unicorns and dinosaurs. 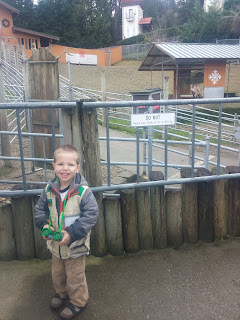 B played it cool at the reindeer exhibit. 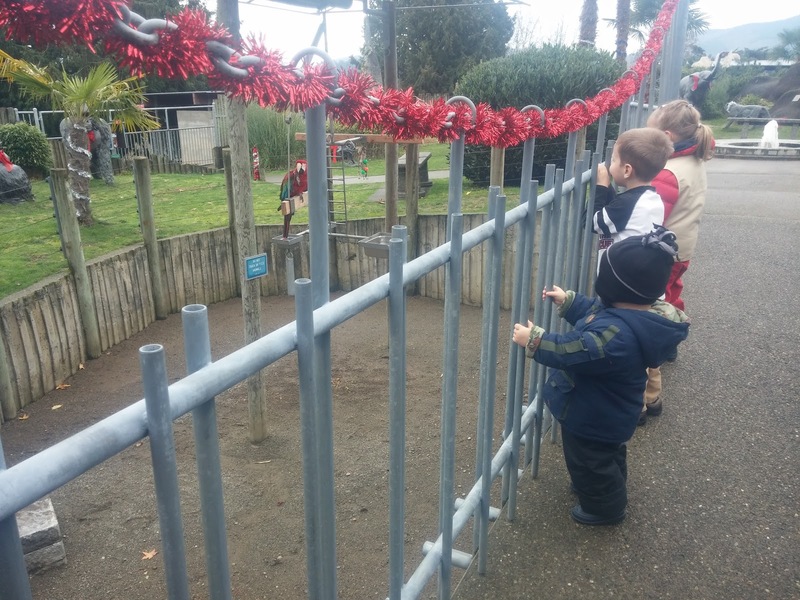 When I asked him what he thought about these reindeer, he shrugged, and said, "I've seen them before." What?! I'm on to you, kid. He talked for days about the reindeer who had to have their antlers cut off because they were fighting each other, so I think he was impressed. Grandpa Michael was able to come to the zoo with us. 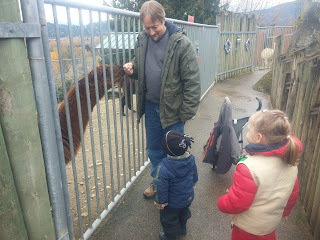 The animals are very friendly, since zoo visitors are allowed to feed them. This alpaca was REALLY hoping that we had something to feed it. This macaw was silent for a long time, but eventually we got it to demand a cracker. Then it didn't want to stop talking. Cougar Mountain Zoo is just the right size for the attention of small children. Just as we came to the end of the zoo, rain started falling, and Sammy started to melt down for lunch and a nap. 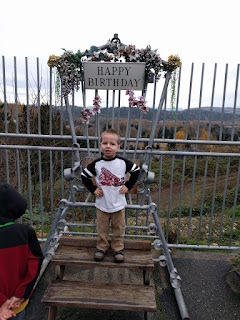 We stopped for a quick photo on the birthday throne, and then headed off to pick up B's birthday cake. 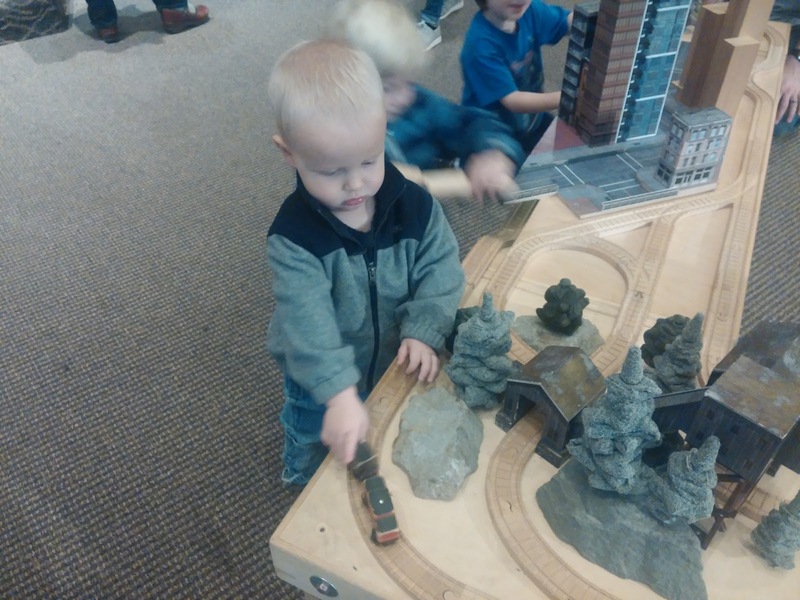 After a short break at home, we drove over to the Inglemoor Presbyterian Church for their train day. 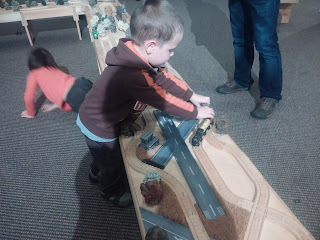 They had all kinds of model trains and train and track building sets. Jared, B, and Sammy happily drove trains around on this enormous train table for an hour while I chatted with other parents. Grandpa Michael was in model train paradise. B was convinced that this train event was especially planned for his birthday. 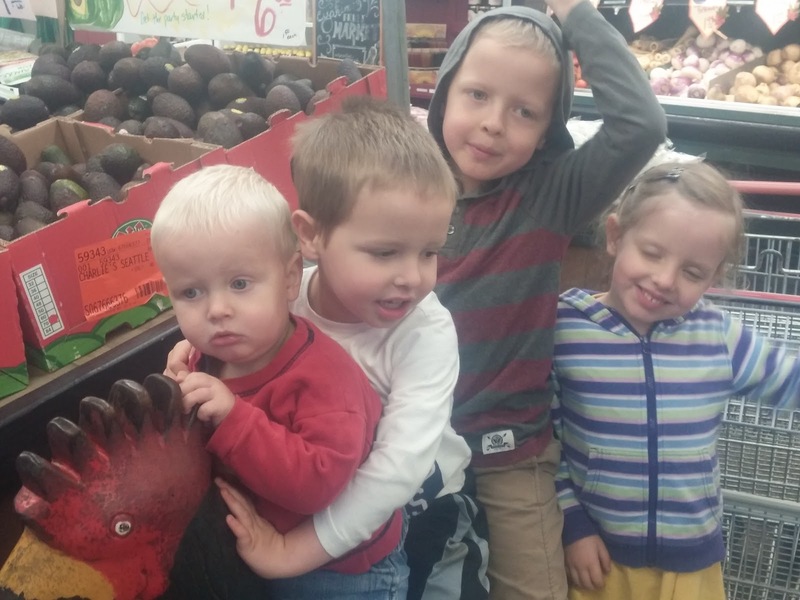 B loves his friends. I invited a few friends to come over for cake and a Christmas craft at the very last minute, and we had a pretty good party turn out. My friend Bri made B's cake. It was a miracle of culinary engineering, and B was delighted. 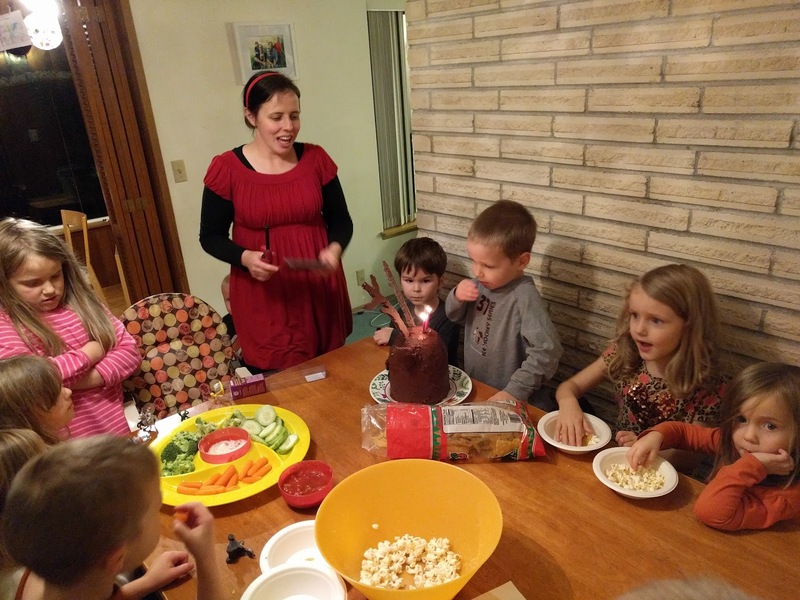 Everyone wanted to eat a piece of chocolate antlers. B announced that they were "real antlers, only made out of chocolate." I'm sure all of the reindeer would love to have real antlers made out of chocolate. 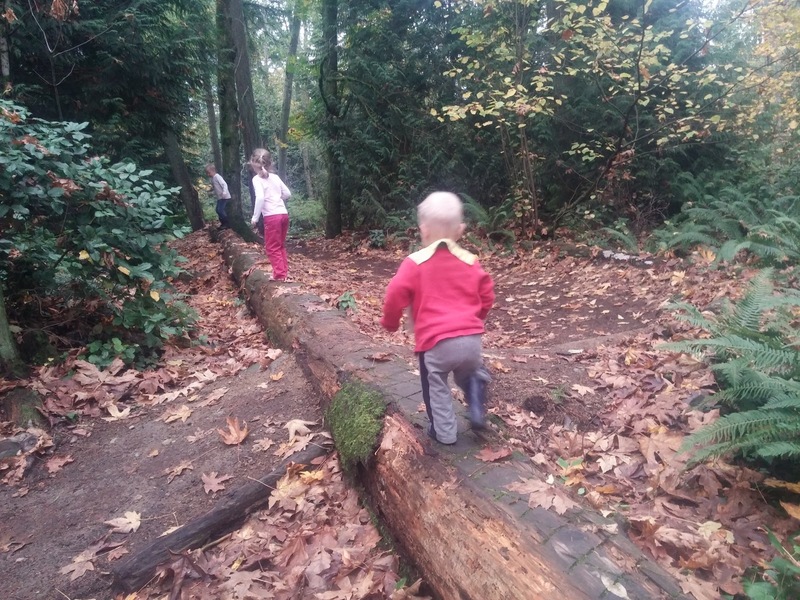 In November, autumn arrived in earnest. Our trees unburdened themselves of about ten million leaves. Part of the magic of owning a leaf blower is that it acts as a giant blow dryer for all of our soggy leaves as it rounds them up into a pile, so we don't get as wet as we otherwise would when we jump in the leaf pile. 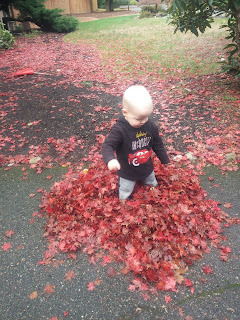 Sammy was NOT a fan of the leaf blower, but he loved the leaf piles, after Jared showed him what to do with the leaves. This kid. 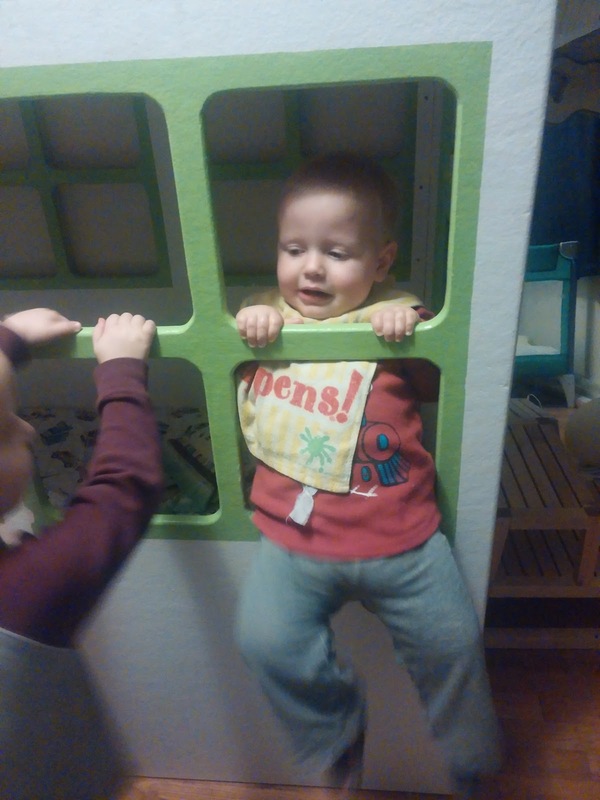 He loves the sensation of falling, and he loves climbing on unusual things. In the picture below, he had invented a game of climbing from the mattress in the playhouse bed onto the playhouse window, and then dropping himself backwards onto the mattress to bounce. He laughed and laughed. He also figured out that he could ease himself out of the window onto the floor. He is a strong kid. He is also determined to do what the bigger kids can do. 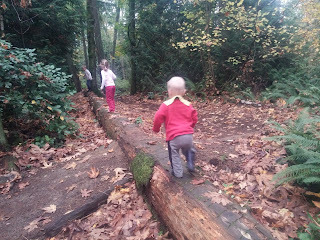 Even B still likes to hold my hand crossing this log bridge, but Sammy insists on doing it by himself. 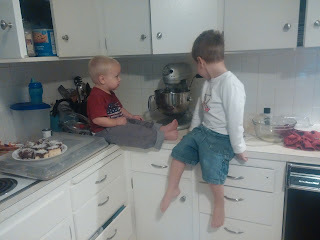 He has fallen off a few times, but he never cries about minor falls, and he insists on climbing back up and continuing. This was a big milestone for the month of November. Sammy made a tenuous peace with the leaf blower, and even picked it up once, but not when it was on. 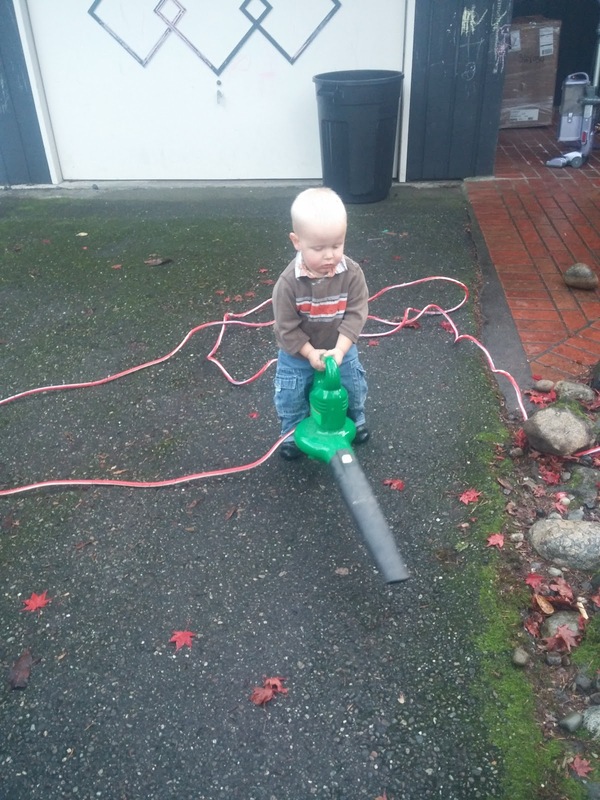 I guess the leaf blower and the blender are in the same category. B taught Sammy how to announce that things are "Loud!" and cover his ears, but, of course, Sammy doesn't quite hit his ears with his hands, and puts his hands on the back of his head instead. 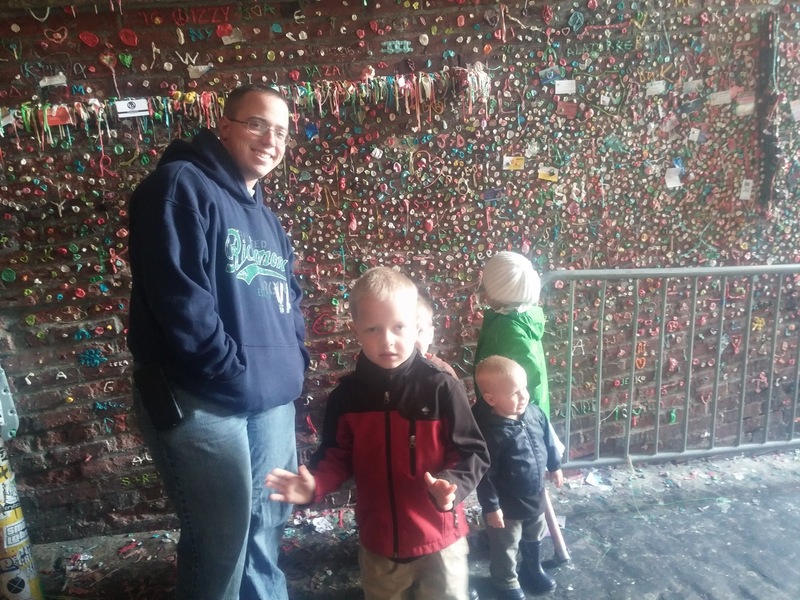 Late on November 12, my brother, Seth, who had never been to Seattle before, came for a visit. . . and decided to stay. Actually, he decided that he was going to stay two days before he came. Jared and B moved into the same room, naming it "The Monster Bat Cave." The jury is still out on whether or not that arrangement is working. 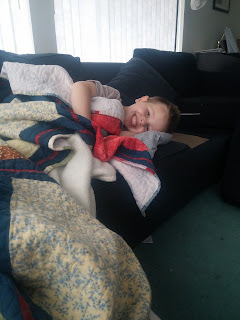 B wakes up much earlier than he did before, since he always wants to do what Jared does. 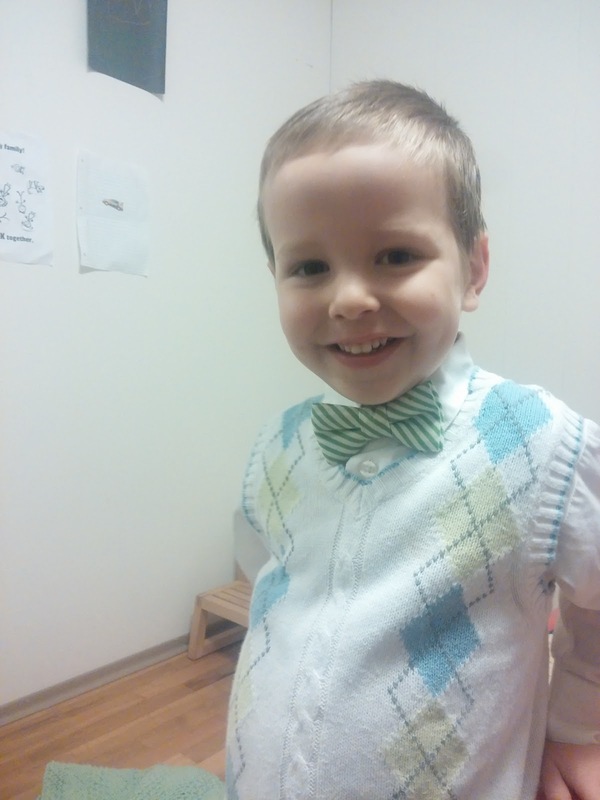 Within two days of arriving, Seth had two job offers. We tried to cram in some fun before he disappeared into work. He had to see Pike Place Market. 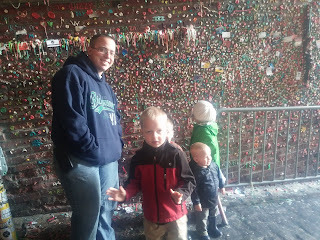 When Todd saw this picture he was horrified that Eloise was actually touching the gum wall. I'm pretty sure she was just placing her gum on the wall. At least I hope that is what she was doing. 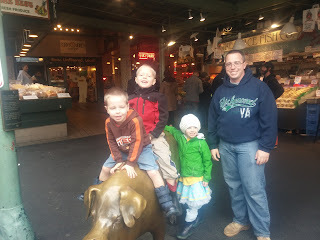 We walked around the market until we all had tired legs, and then we remembered that we hadn't posed with the pig yet. 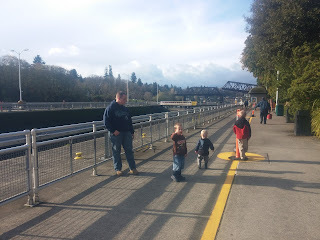 We picked up lunch to take with us to the locks, which were less exciting than they have ever been before. Not a single boat came through while we were there, and the large lock didn't even have any water in it. No trains passed, only one tiny fish was in the fish ladder, the museum was closed, and the blue herons were all sleeping. The most exciting thing we saw was a couple of ducks diving. 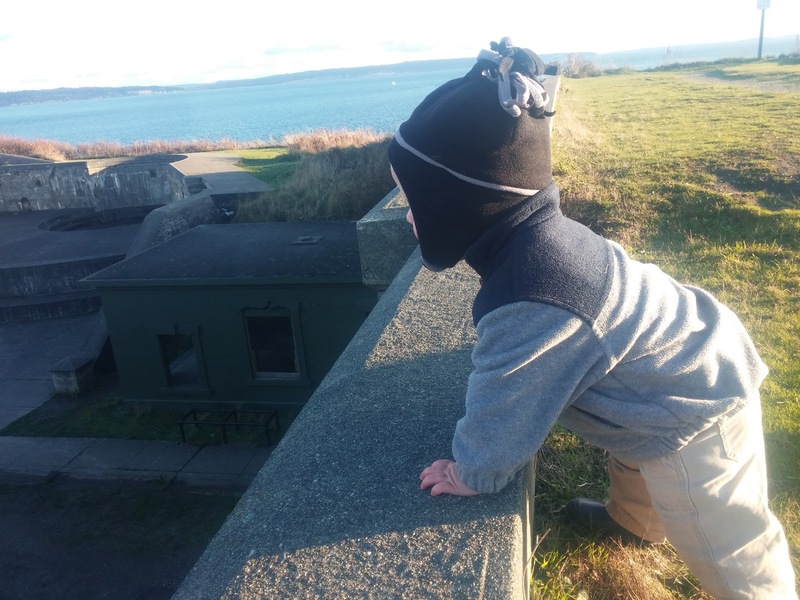 Two days later, after a recovery day, we took Seth to Whidbey Island to see Fort Casey on November 16. 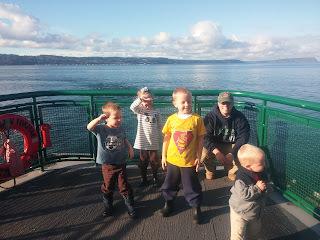 First trip highlight: the ferry ride. Washington's islands are so beautiful. 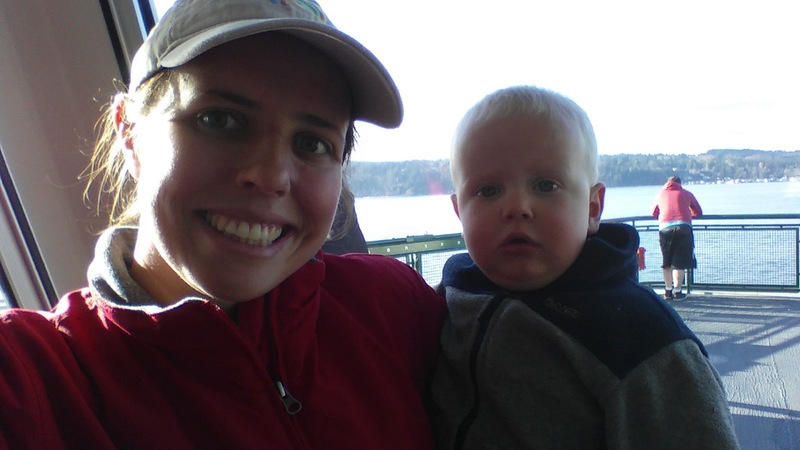 Sammy didn't really know what to make of being on a boat, but he loved watching the cars. 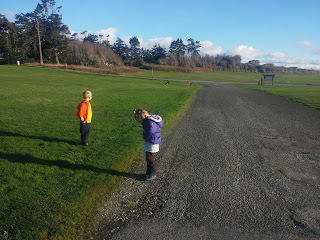 At the park, we were greeted by a family of deer grazing in the field, and some freezing wind. Remember what I said about our islands? I've never seen a view I love more than this one. 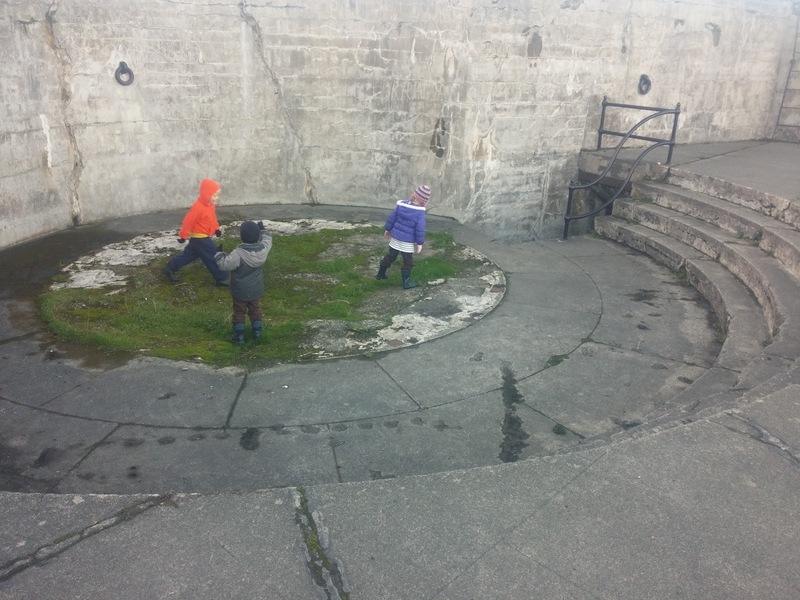 I don't think building codes were a thing when Fort Casey was constructed. All of the stairs are extra tall, and there are no railings, so the kids go down backwards. A gun mounting depression. 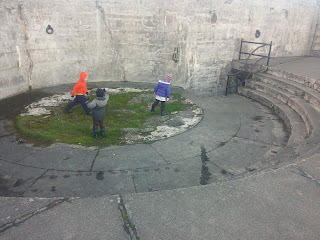 . . or an amphitheater? 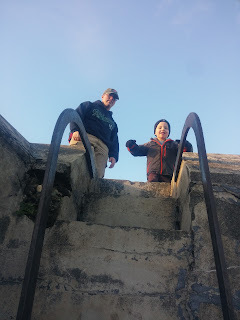 B went up this ladder with Uncle Seth, but there was no way he was coming back down the same ladder. Seth had to walk him the long way around and back down the scary stairs. Speaking of scary. 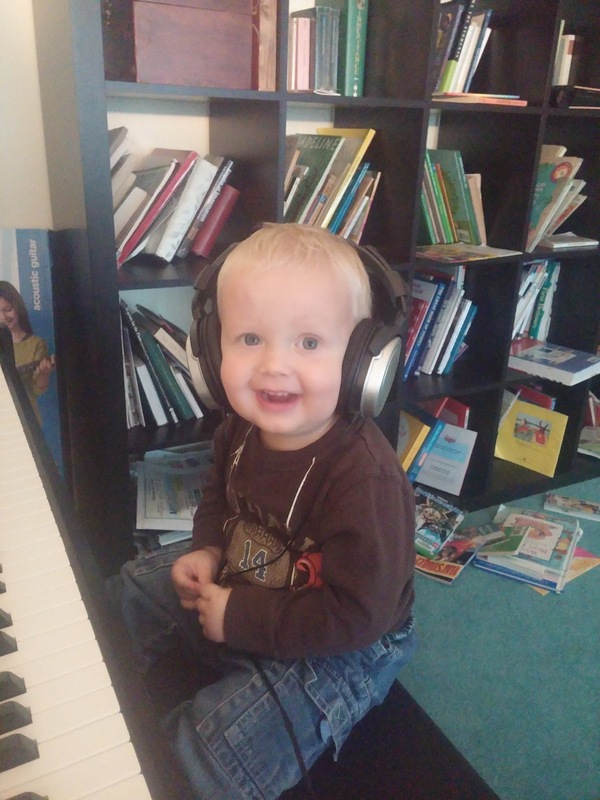 . . toddler + no guardrails = my life shortened by about ten years. Sammy had me on edge for the entire time. 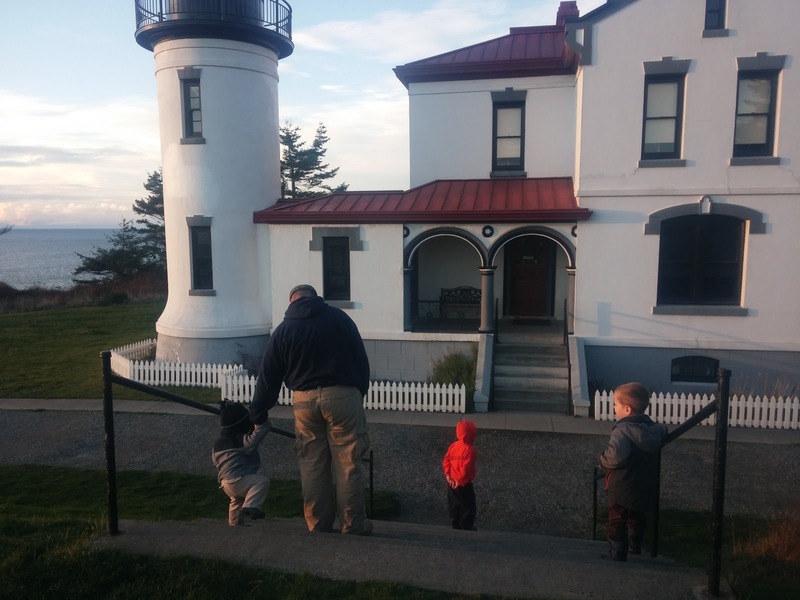 After wandering around the fort for a while, we all wanted to see the lighthouse, but our legs were too tired to walk the quarter mile uphill, so we drove over. Sammy and Seth had an instant bond. Seth only speaks to Sammy in Spanish. After only two days of being around Tio, Sammy heard something in Spanish and started calling, "Tio? Tio!" Children's brains are amazing. Yes, that is a five year old child in my baby carrier. She only weighs ten pounds more than her one year old brother (and only two pounds more than B). Eloise, like me, does not function when she is tired. 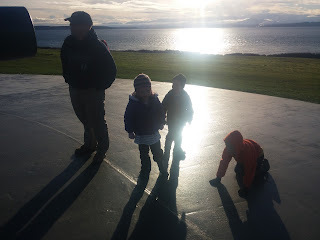 We drove back down through Whidbey Island. I had some serious Ragnar reminiscences as I drove through some of the places where I ran in July. 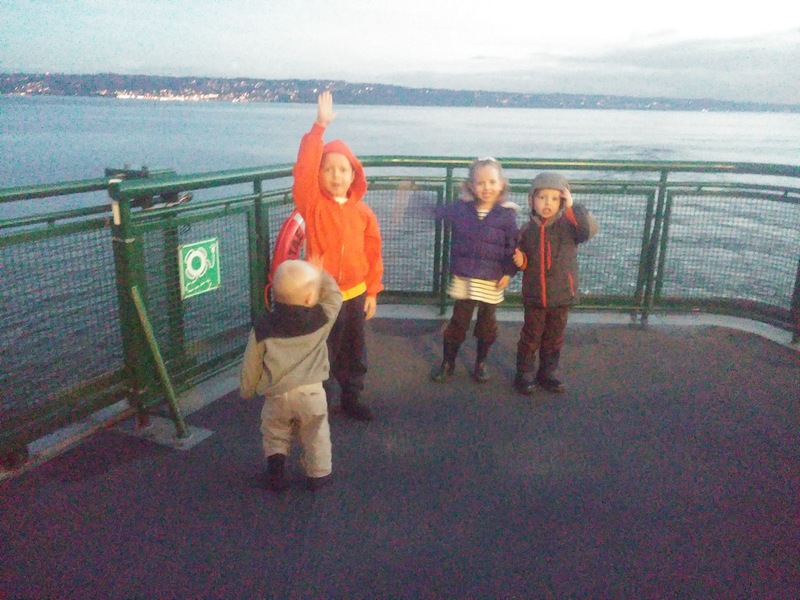 The sun set while we were on the ferry, and it got seriously cold. We stopped on the way home to pick up a toilet for the final stage of our six(ish) week long bathroom remodel project. I simply wanted to swap the giant vanity in the kids' bathroom for a smaller sink so that there would actually be room to turn around in the bathroom. I should have known that nothing is simple where plumbing is concerned. 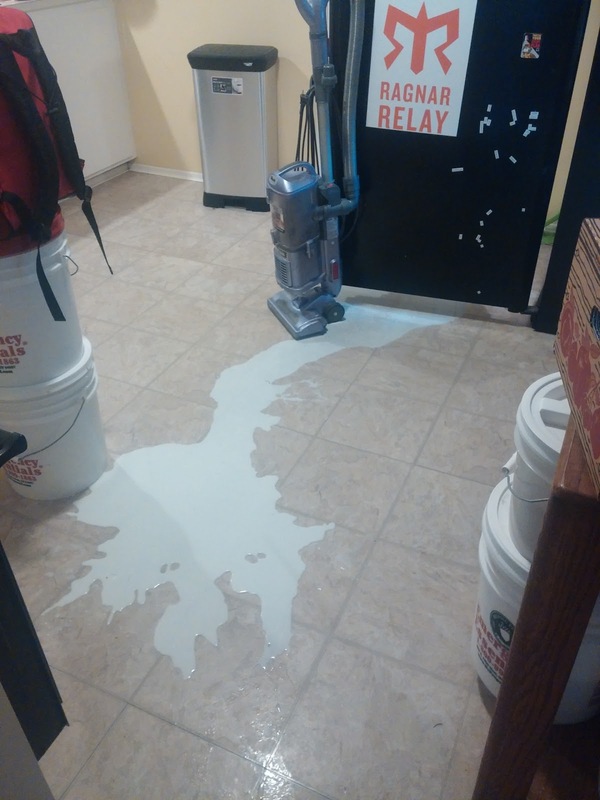 Actually, the problem was the floor. When Todd pulled out the vanity, he discovered that there was a big section underneath it that didn't even have a subfloor. Since he had cracked the toilet pulling out the vanity, he decided to just refloor, paint, and replace the sink, toilet, and baseboards. He also wanted to take out and replace the tile around the tub, but I drew the line there. Having the kids glide like specters through our bedroom in the middle of the night to use the master bathroom toilet was creeping me out. They needed their bathroom back sometime this year. 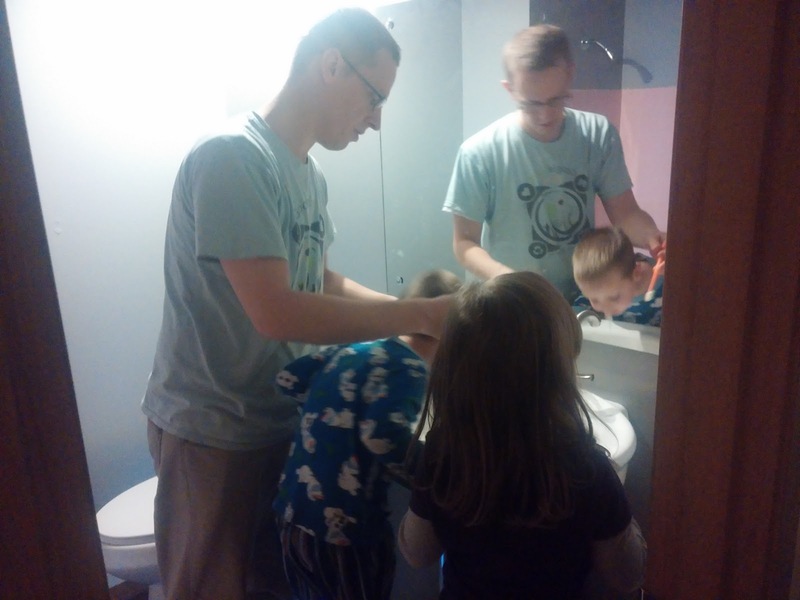 Here is the first teeth brushing in the newly completed bathroom. Notice how three people can fit around the sink without being pressed against the toilet and the door. Todd did great work. Now the house is ready for potty training round #4, sometime in the next two years. 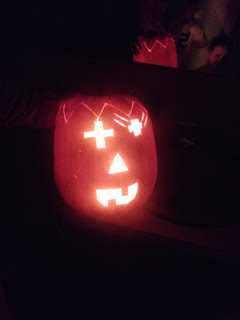 Coming right after Halloween, as it does every year (weird), is Todd's birthday! This year was the big 33. These double digit birthdays only come around once every eleven years, so we tried to make it special, even though Todd doesn't ever have any expectations. That is probably my fault from all of the years when his birthday snuck up on me, and I forgot to plan anything (every single year). The kids were excited to celebrate with some gifts they picked out: a very loud red tie, and a t-shirt that says "The cops just pulled me over for carrying these guns!" With arrows pointing to muscles on a stick figure. They were hoping it would make him laugh, and it did. Every time he wears it, Jared and Eloise glow with pride that he is showing off the shirt that they picked out. Eloise and I also framed one of her watercolor paintings to hang in his office. Eloise loves to create. The day after Todd's birthday I had planned for us to go kayaking together. Of course, after a gorgeous sunny week, autumn weather returned with a vengeance for our outing day. We ended up going out for lunch and a movie instead. We are not such die hard occasional athletes that we feel the need to suffer in a tiny boat on a miserably rainy day. Our babysitter, Amy, brought Nemo fruit snacks for Sammy, since she knows he loves Nemo (which is actually his name for all fish). She also brought a reindeer antler craft WITHOUT EVEN KNOWING about B's infatuation with reindeer. 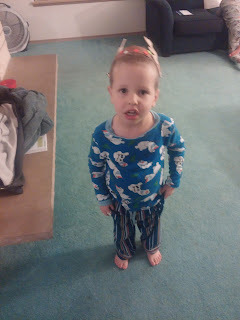 I think that these antlers may have to be surgically removed from his head in a few years. That is the only way they are ever coming off. 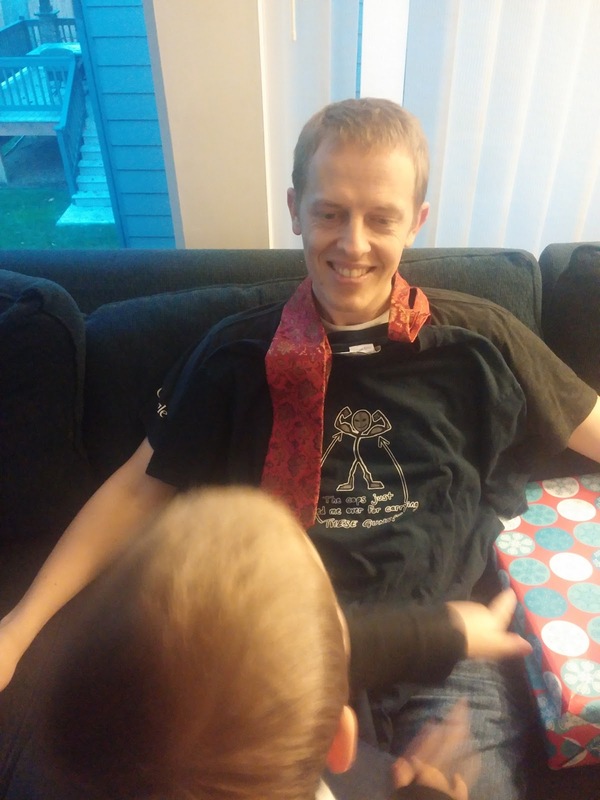 It was a low-key birthday, as Todd likes them. I made Todd's favorite pumpkin chocolate chip muffins instead of cake. Due to a happy coincidence of timing, Cambell's mom, Darcy, was also in town for Todd's birthday, and sent over some of her famous chocolate chip cookies, which have been his favorite since he was a kid. 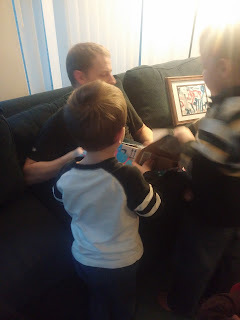 Our friends, the Allens, came over for pizza and a movie, and we managed to get all of the kids distracted for long enough to play a board game. Jared opened his very own bank account. 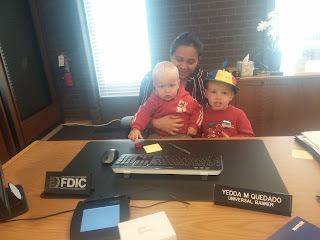 Our banker was kind of in love with Sammy. Sammy figured out how to open the refrigerator AND the milk. . . yeah. That was not cool. At this time of year, up here in the north-lands, we have to carry flashlights and wear reflective gear when we leave the house after 3. We walked over to meet Daddy on his way home from work one day. I ran a 10K in St. Edward State Park. It was a monster. It was my first 10K ever. 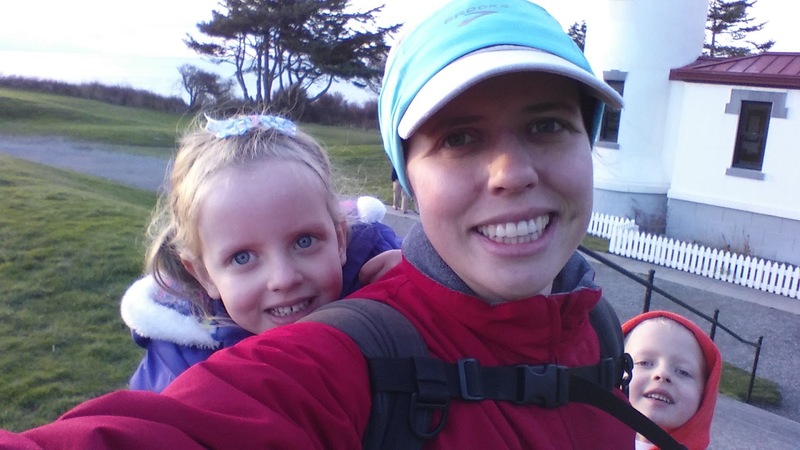 It was all on trails, and it had one major hill that had to be climbed twice on the course. There was a half marathon on the same course (two laps instead of one), but a lot of people cashed in after one time around the course. 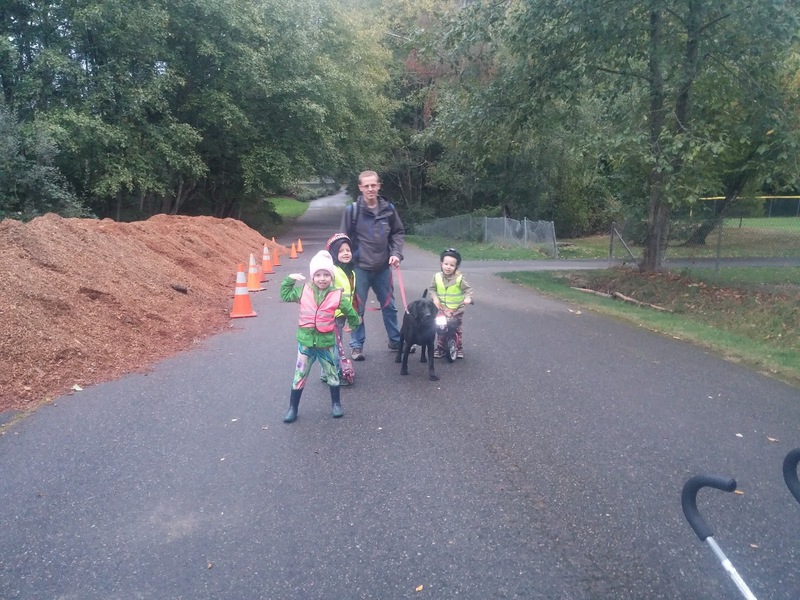 I walked from home to the starting line, and Todd brought the kids over later to watch me cross the finish line. 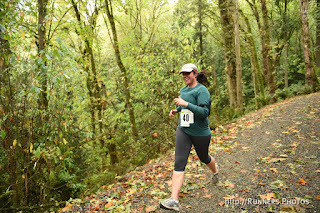 This is a picture of me taken by the official race photographer as I entered the last mile (half of it went straight up). It was a hard, muddy course, but beautiful. 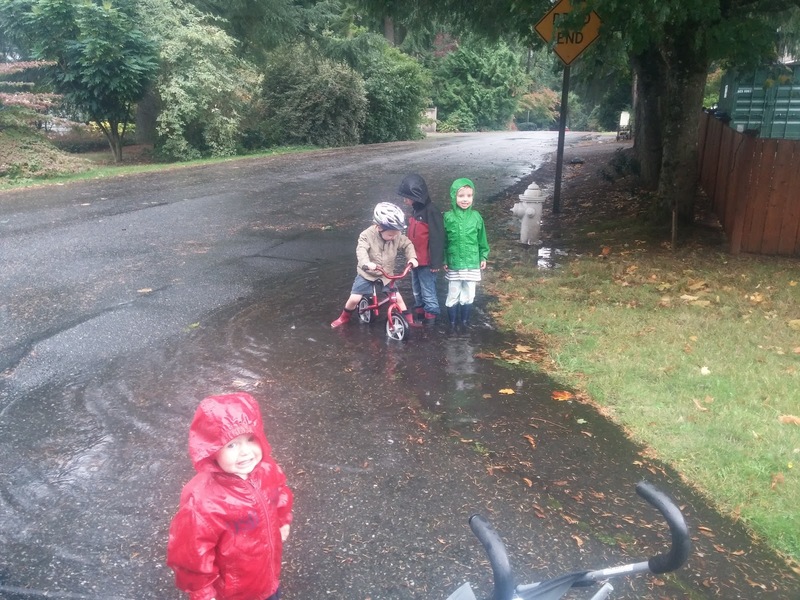 This is The Puddle in our neighborhood. So far this wet season, Sammy has only fallen in the deep part twice, and Jared has swamped his boots once. Multiple gloves have been dropped in the water, though. A lot of walks end here, since we end up too wet to go on. 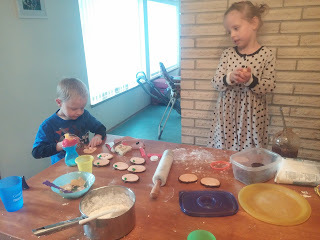 I made the mistake of letting B pick any cookie he wanted me to make out of a cookie cookbook. Of course he would pick one that required rolling, fondant, decorating skills, and patience that I don't really have. 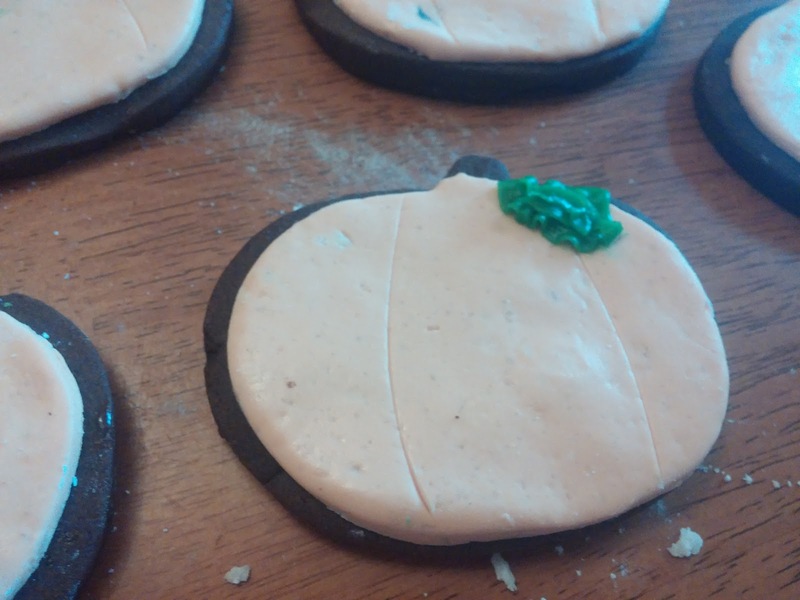 It took me three days to make cookies, roll cookies, and make and shape fondant. 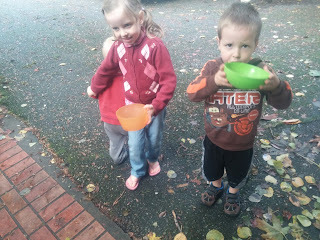 On October 14 we had a typical autumn windstorm that knocked out power for a few hours. Consequently I had to learn to make our Friday night pizza on the stove top, using our camping stove. 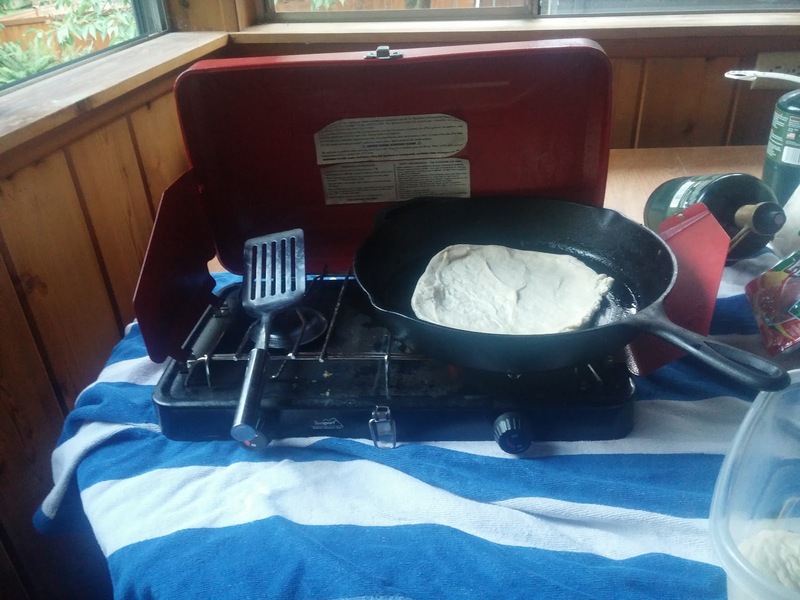 This process was sped up a lot when the power came back on while I was making the second pizza, but now I have a skill that I didn't have before. 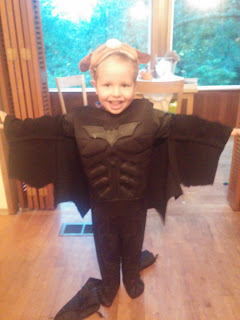 B is a flying bat-dog. Just a typical morning. 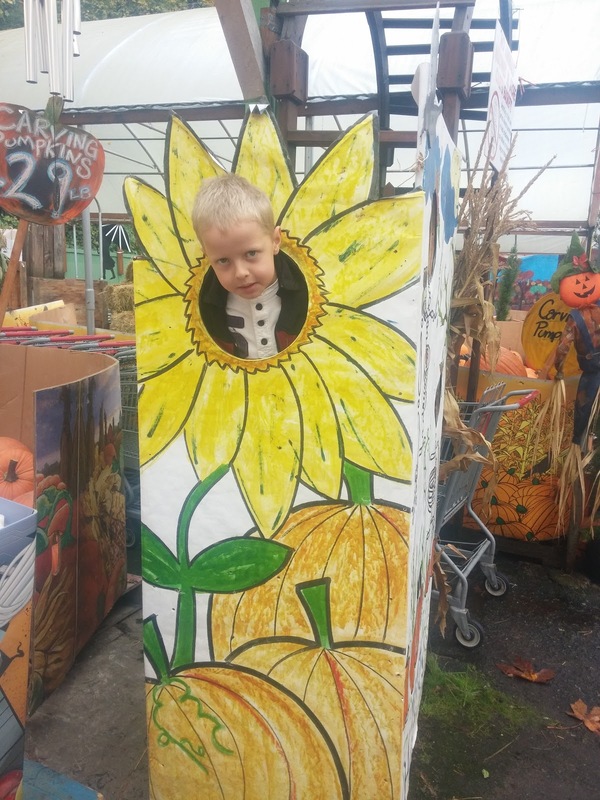 The market decorated for autumn. 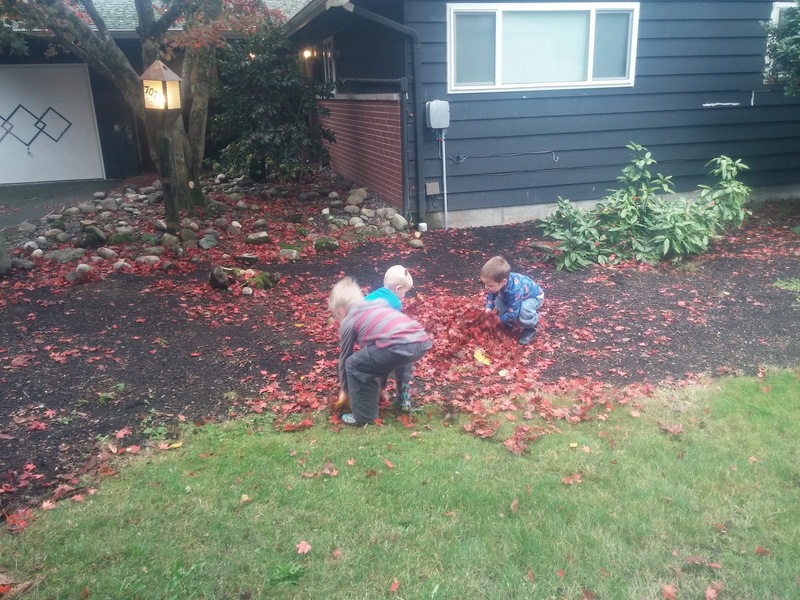 Our neighbor, Betty, let the kids pick the last of her golden raspberries. 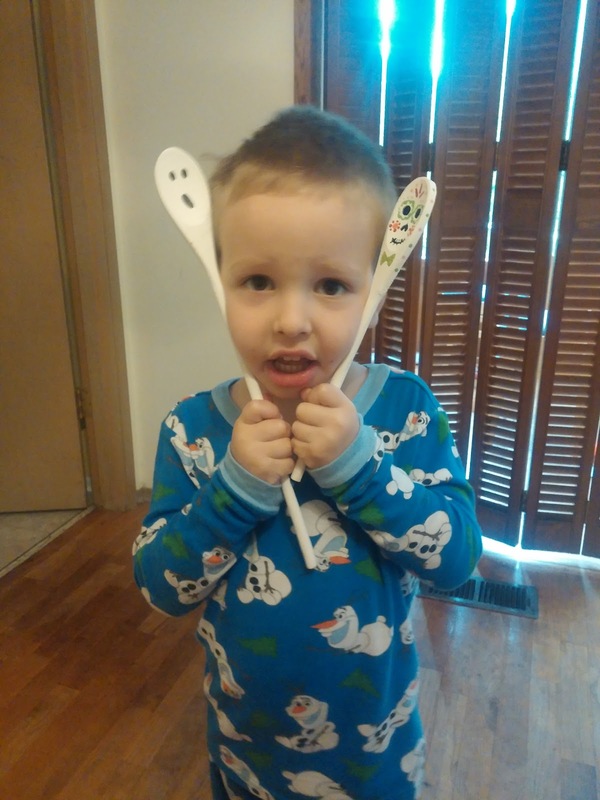 I painted some Halloween spoons at a relief society activity. B saw them, loved them, and demanded that I make him some turkeys and a Santa, so I made a set for each of the upcoming holidays. This is the face that I can't say no to. 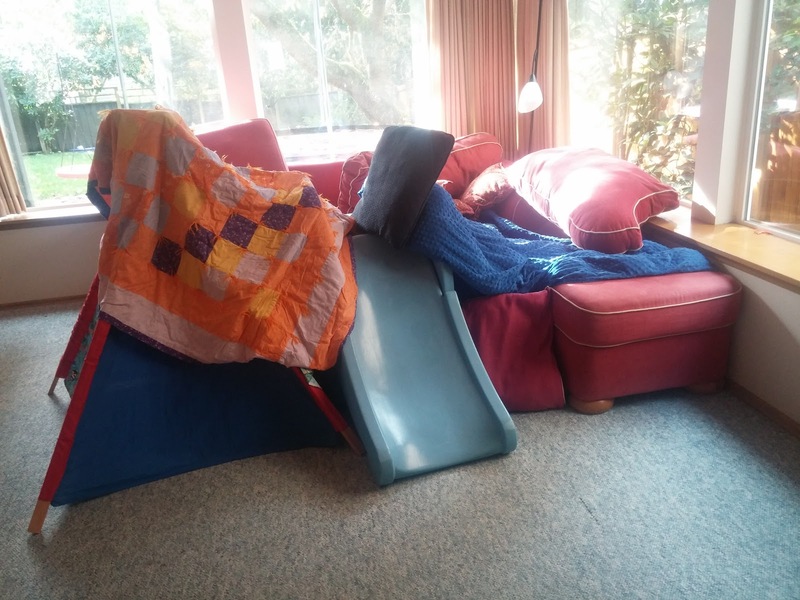 We made an epic pillow fort. 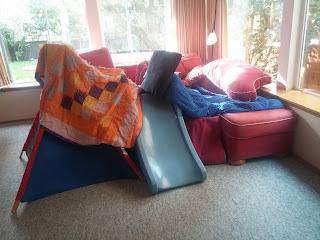 We also swapped our upstairs and downstairs couches so that there is more room to run around and be crazy downstairs. 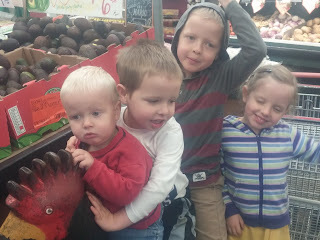 We tried fitting everyone on the rooster at the fruit market at the same time, but they didn't quite fit. 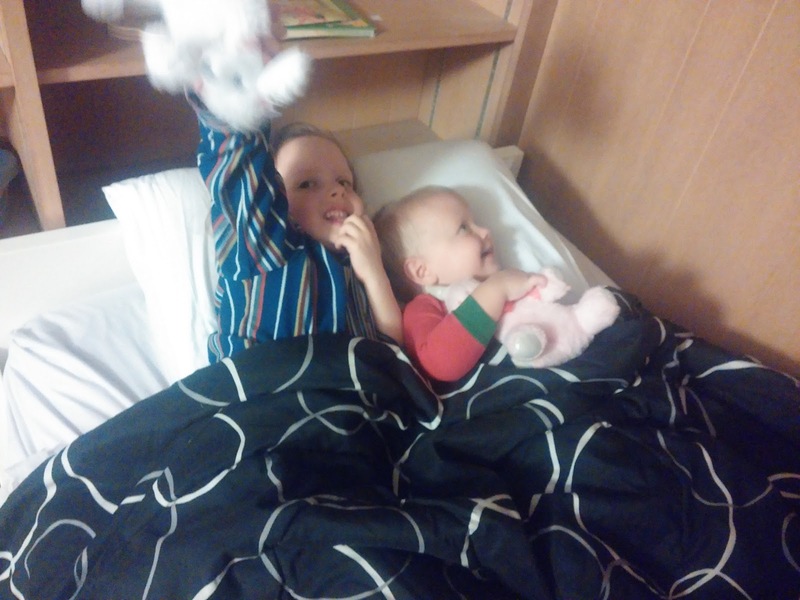 Sammy likes to help me put the other kids in bed. Sometimes things get silly. B had one very bad night's sleep, and spent most of the next day lying on the couch. Sammy and B perched on the counter watching the mixer. Next to Sammy is a plate of lamington I made when we were learning about Australia and New Zealand. 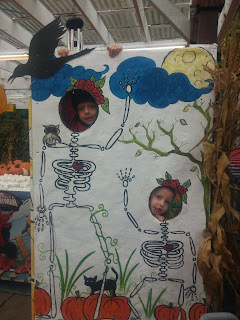 On October 28, we surprised the kids by taking them to Google Halloween. 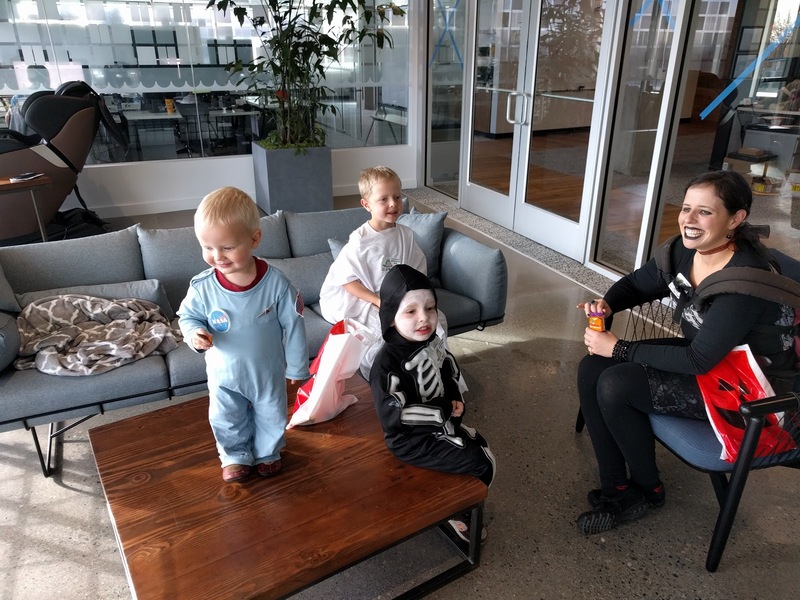 After last year's Halloween burnout, we told them that there would only be one Halloween celebration this year. They had to choose between our church trunk or treat, Google Halloween, and trick or treating in the neighborhood. 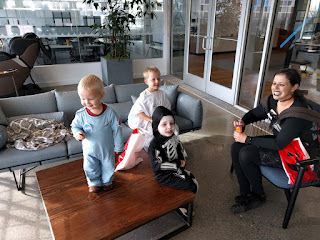 They chose the latter, so taking them trick or treating at Daddy's office was a surprise. 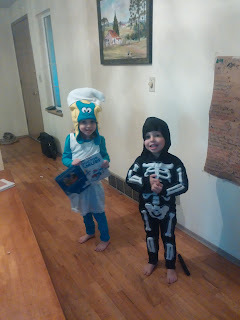 Here are some of their costumes. B was a skeleton. Eloise was Smurfette. 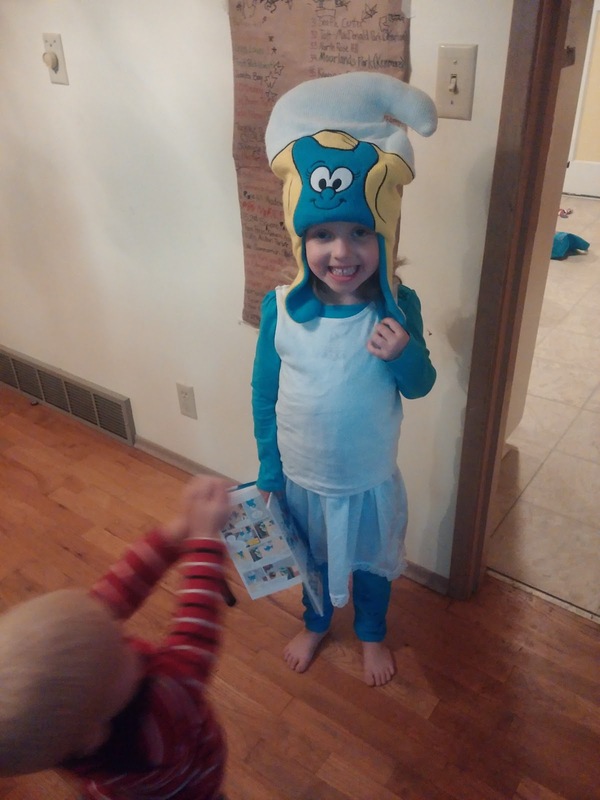 She loves the smurfs. Sammy was an astronaut, and Jared was a ghost. This is our jack'o'lantern. 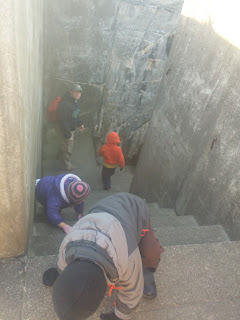 Each of the kids designed a feature, drew it on in pencil, and I helped them cut. 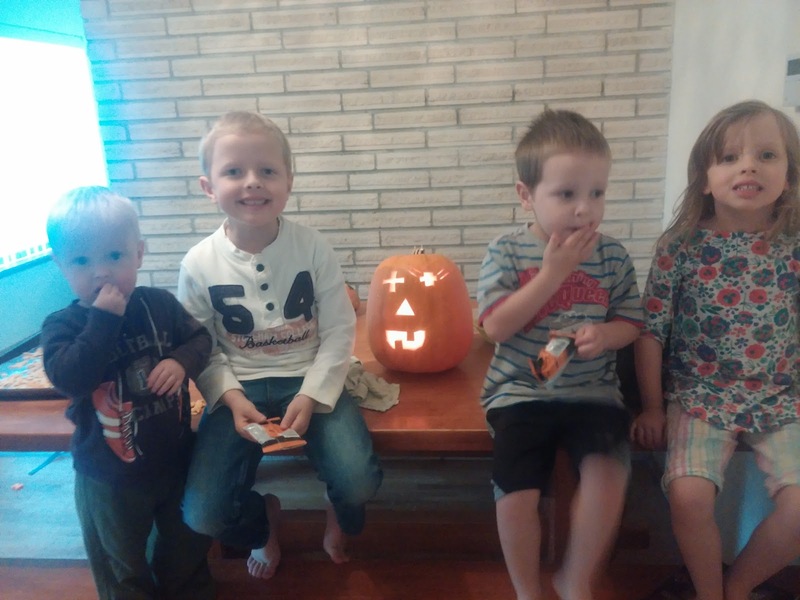 Here they are with their creation. 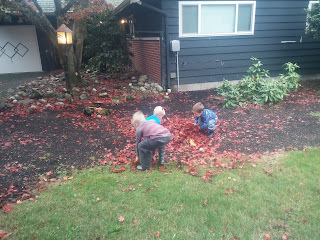 Our three big trees dropped a lot of leaves in October, so we spent a lot of time raking/jumping. On Halloween, the Carvers came trick or treating with us. 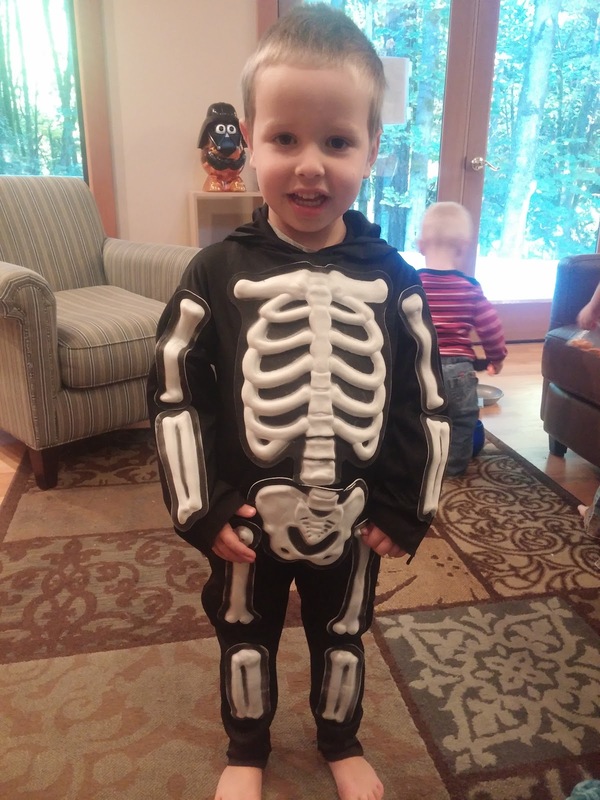 I was planning to stay home with Sammy, but he saw the other kids getting their costumes on and ran to get his shoes and jacket, so we all went. It was raining. We made it about halfway around the block, and then everyone was done. 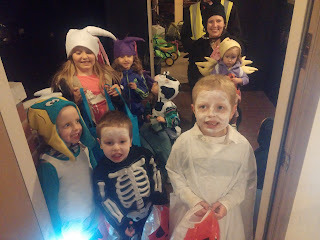 One chaotic hour of candy collection was much better than last year's days long costume-and-candy-fest. Happy Halloween!